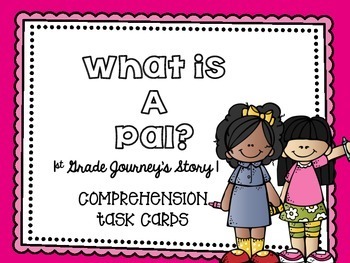 These Comprehension task cards go along with first grade Journeys story 1 (What is a Pal?). These can be used as a review for weekly test, or for extra practice. Can use this in interactive notebook, place around the room, or place on student desks. 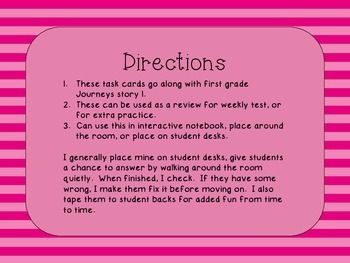 I generally place mine on student desks, give students a chance to answer by walking around the room quietly. When finished, I check. If they have some wrong, I make them fix it before moving on. I also tape them to student backs for added fun from time to time.